Since 2012-2013, Cal Poly has offered particular students the option of obtaining gender-inclusive housing. The university defines gender-inclusive housing as an effort to support students who identify as transgender, genderqueer or gender questioning (TGQQ). 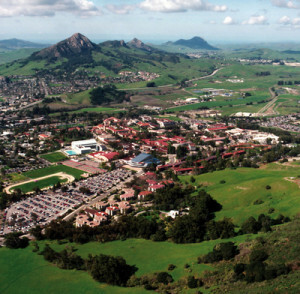 Previously, the university only offered gender-inclusive housing to returning students living in the on-campus Poly Canyon Village apartments. This fall, anyone who identifies as a member of the TGQQ community or who is supportive of the community and is comfortable with a roommate of any gender identity may live in the special housing arrangement. Gender-inclusive housing will be available in the Cerro Vista and Yosemite Hall dorms. University officials say students who may occupy the gender-inclusive housing include individuals of the same gender or gender identity, such as members of the lesbian, gay, bisexual, transgender and questioning (LGBTQ) community, as well as supporters. Students can designate their preferences on campus housing applications. Thus far, 128 returning students, 105 first-year students and eight transfer students have been assigned to gender-inclusive housing for the upcoming school year. About 7,000 students are expected to live on the university campus this fall. Last year, the pro-diversity protest group SLO Solidarity ordered Cal Poly administrators to deliver on a list of 41 demands, which included mandatory gender and ethnic studies classes; gender-neutral living quarters and bathrooms; and a dramatic increase of tenure-line “faculty of color.” SLO Solidarity said it would demand a new administration if the demands are not met. In response to the expansion of on-campus gender-inclusive housing, SLO Solidarity leader Matt Klepfer said Cal Poly took a big step toward having standard practices that exist at most other universities nationwide. Cal Poly spokesman Matt Lazier said the change is a result of the university’s effort to create an open and welcoming environment for all members of the campus community. “This fall, anyone who identifies as a member of the TGQQ community or who is supportive of the community and is comfortable with a roommate of any gender identity may live in the special housing arrangement. ” Students will apparently have to sign some form to qualify. They better hope that Cal Poly has good data privacy policies. Despite how open our society is now, both society and people change. Students who register for such dorm space might not want to be confronted with form 15 years after they have graduated. I know for a fact that students who specifically requested NOT to be assigned have been assigned the dorms they set aside for this program and housing will not disclose whether their wishes were honored or not. Housing also states that these numbers are wrong. Amazing that students who want this housing have their wishes granted while those who would prefer not be be in the special housing units (they are grouped together as Cal Poly tends to do rather than be inclusive) are not given the option. Something is wrong with that. Why is everyone so sensitive about transgender stuff. Like, how many handouts do you need? Doesn’t giving them a labeled dorm location make them standout and more vulnerable for criticism? Knowing Cal Poly, they will use the transgender card to get more and more funding, whilst raising tuition at the same time. I had a roommate in college that was gay, never bothered me. We didnt have transgender dorms or gay dorms and no one cared. And that was at the largest liberal arts college in the country. Keyword in your post, Liberal. People are always so quick to judge. Why is it necessary to create a new label? Why not just provide more co-ed housing. There was no Veracious Hetero Housing or and any other sexual flavor from the box of genders in yesteryear. This special head discussion is beginning to annoy me, certainly something I would not burden the budget with. you know, Jorge E. you have always been pretty much spot on. thank you and write your rep. if i say anything beyond this it exposes me, BUT my son is a man and my daughter is a women.